BAR HARBOR, Maine — A brewing firm that has grown steadily since its start 18 years ago in the alcove of a local restaurant just got a little bigger. Founded in 1991, Atlantic Brewing Co. now has two production facilities in Maine and distributes its beers to multiple locations on the East Coast. And earlier this month, with its purchase of cross-town competitor Bar Harbor Brewing Co., Atlantic has added a few other well-known Maine beers to its roster of brews. Doug Maffucci, who co-owns Atlantic Brewing with his wife, Barbara Patten, said Saturday that the purchase makes sense for his company. Bar Harbor Brewing, which was founded in the village of Otter Creek a year before he started his beer business, has established some award-winning beers that have attracted a strong following, he said. Atlantic Brewing becomes the third owner of Bar Harbor Brewing in the past two years. In January 2008, ad executive and developer Evan Contorakes bought the company from founders Tod and Suzi Foster. Maffucci said he found out last fall that Bar Harbor Brewing was again for sale and that he didn’t want to see it sold to a larger company from away that wasn’t interested in maintaining the Fosters’ legacy. The Atlantic Brewing owner said he wasn’t sure how his brewers would react to the prospect of taking over what had been a competing product and keeping it going, but it turned out not to be an issue. Brewers James Taylor and Jon Hill were eager to learn how to make the Bar Harbor Brewing brands, he said. Maffucci said he intends to resume making Bar Harbor Brewing’s three main beers, which have been out of production since October, and he hopes to keep them close to their original recipes. His company already has started making them and hopes to have Cadillac Mountain Stout, Thunder Hole Ale and Harbor Lighthouse Ale available in stores by the beginning of May. He said he also plans to make them available in draught, which none of the previous owners ever did. As for Bar Harbor’s other beers, which include blueberry, peach and ginger-flavored ales, he said he would take a wait-and-see approach. Atlantic Brewing already has its own ginger- and blueberry-flavored beers, he said, though his blueberry ale and the one the Fosters developed are different enough that they might be able to co-exist. He said Atlantic’s nine existing beers would stay as they are. Maffucci plans to continue making and marketing the additional beers as Bar Harbor Brewing Co. products. 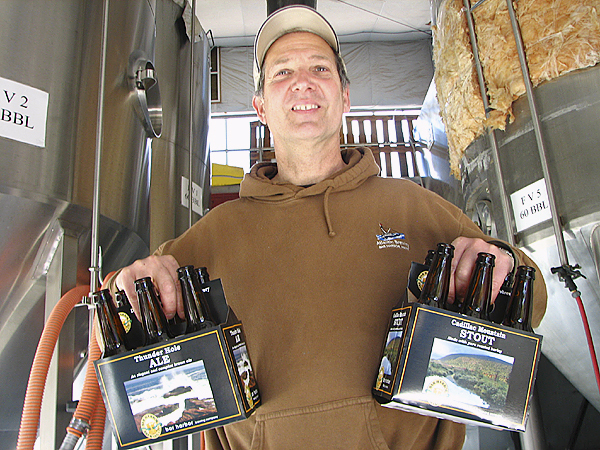 To help with the transition, Maffucci has hired Bar Harbor Brewing brewer Dave Kilgour to continue making the beers. Maffucci said the additional workload should be manageable for his company, which also makes two flavors of soda and, for the past six years, has produced wine at a winery on Route 3. Atlantic Brewing made 150,000 gallons of beer last year, he said, and his goal is to make 25,000 gallons of the Bar Harbor Brewing brands, to start. He said all beers would be produced at facilities in Town Hill or in Portland. Since 2001, Atlantic Brewing has had space at Shipyard Brewing Co. in Portland, where it brews its own beer. Atlantic contracts with Shipyard to bottle some beer for out-of-state distribution. Maffucci said he never imagined in 1991 he one day would run a winery and would manufacture 12 types of beer at two production facilities. He got his start in the beverage business when he and a former business partner simply decided they wanted their own beer to sell at a restaurant they owned and ran in downtown Bar Harbor. They recruited a friend to help brew experimental batches in an alcove of the cafe, and made batches in a vessel about the size of a bathtub. Acadia Brewing Co., as it then was called, had only three employees at first but now its successor employs a dozen people year-round and twice that many during the busy summer tourist season.